The conditions have been so good lately that even Santa wanted to join us for a dive at Portsea Hole, unfortunately for me Santa was in Chris’ team & we didn’t get to see him under the water but I believe he is now signed off as a PADI Advanced Open Water diver!! 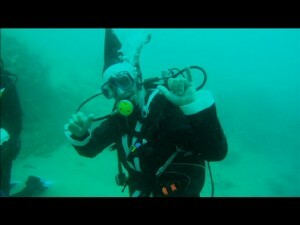 Santa would not have been disappointed with the conditions either, sunny days, flat water & 10-15metre viz! !